Results: Which Button Copy Worked Best Late In The Funnel? Growcode, the eCommerce optimization provider conducted this savvy shoe study for their client Warsaw Sneaker Store. As part of an ongoing series of tests, the team took a data-driven approach, finding several opportunities to test and optimize the shoe store’s eCommerce site. In a previous study, the testing team looked at whether changing the text color — to highlight product availability info — affected conversions. Results were surprising. You can check out the full study write-up here. 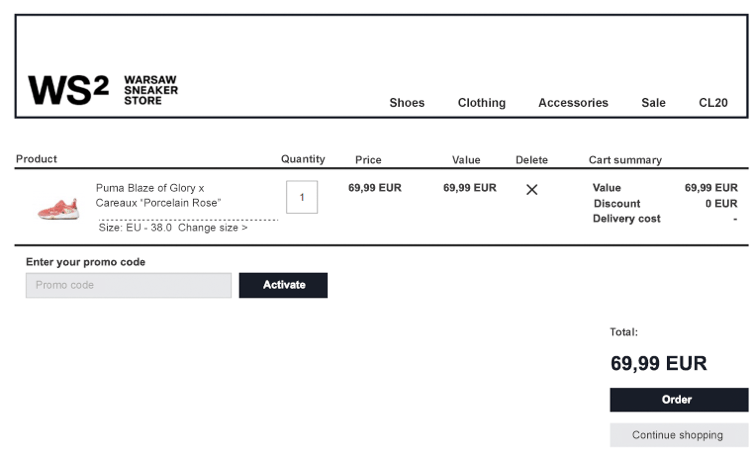 In this test, the team wanted to know whether changing the checkout Call To Action (CTA) button text made a difference. The text originally used the commitment word “Order”. The team wondering if changing the text to the less committal instruction “Go to checkout” would reduce hesitancy and improve conversions. 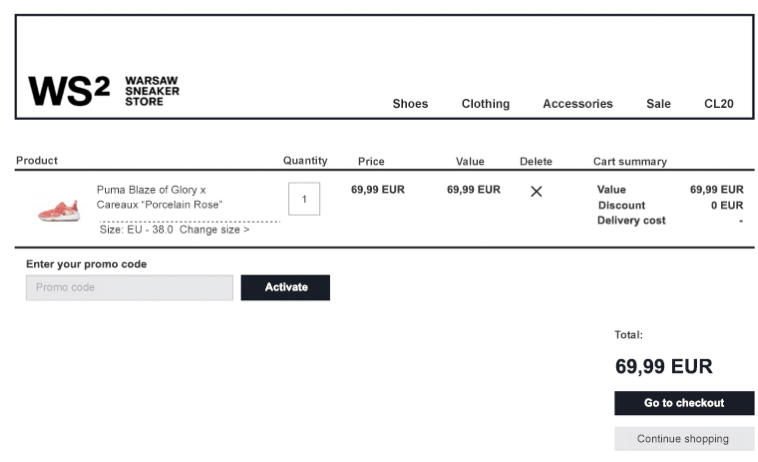 The team speculated changing the CTA text from “Order” to a softer ask, “Go to checkout”, would create reduce hesitancy and anxiety, lowering conversion friction. As a result, more shoppers would place their order, increasing checkout conversion rates. However, the testing team also considered that using less committal wording could soften the tone so much shoppers would be less motivated to proceed, potentially diminishing conversions. To determine the effect of changing the button, traffic was split 50/50. The test ran on Growcode’s proprietary eCommerce platform. Winner: Version A – Surprisingly — and contrary to the hypothesis — the more committal wording “Order” worked wonders. In fact, changing the CTA button text from “Order” to “Go to checkout” caused an incredible -14% drop in conversions! Testing this change enabled the team to primitively prevent a considerable decline in revenue. Don’t go on gut. Test. Small changes can truly make a big difference in conversions. Copy — especially on CTA buttons — can heavily influence user’s perceived level of “conversion friction”. The right copy must be matched with the user’s conversion intent and friction level. Conversion friction can be defined as the level of difficulty, or number of obstacles users most overcome to complete a transaction, and convert. Friction can be high or low. “High friction” word or CTAs, require strong commitment from the user. They include commanding phrases, like “Order”, “Buy Now”, or “Purchase”. In contrast, “low friction” CTAs gently nudge the visitor along, without requiring strong commitment. Low friction phrases generally start with engaging verbs that make the action seem easy and beneficial. They include phrases like “Learn More,” “Get Free Info,” or “Find Out More”. To increase conversions, friction level should be most appropriately matched with the visitors’ level of conversion intent. Conversion intent can be thought of as a measure of users’ desire to complete a specific transaction. For example, how much the shopper wants to buy the shoes on the website. Users with high conversion intent will typically work to overcome the challenges and obstacles encountered while navigating through a site; they’re highly motivated to obtain the product, like a new pair of stylish kicks. On the other hand, users with low conversion intent will not actively work to overcome the challenges presented in their path. They’re not likely to convert — unless the site is highly optimized. Conversion intent itself is a valuable idea to explore. But, it becomes even more powerful when examined in combination with where the visitor is in the conversion funnel. A conversion funnel is an analogy used to depict the journey users take as they move through a website, acquiring products, or services. From the perspective of conversion intent, a low friction CTA is most likely to work early on in the funnel, like on the homepage. The reason being, visitors aren’t likely highly familiar with the product and haven’t been sold on the benefits of it, just yet. They need more prompting — through gentle nudges. Anything too committal comes across as pushy. Kinda like being asked to get married on a first date. Unless your like Anna, from Frozen, you’re probably not too apt to move forward and say “yes”. The proposal needs to be nurtured more. In contrast, as visitors move through the funnel, they become higher intent. They’ve shown commitment to jumping through any obstacles, and have learned about your products, or services. They’re actively taking steps to acquire your offering. They’re getting ready to complete the transaction. As a result, higher friction CTAs may be better served later in your conversion funnel, like on the Cart page. That’s because visitors have already indicated conversion intent. They now just need a strong push to finalize the action. It’s like they’re jumping into a cold, deep pool. They may be hesitant. But, a strong compelling “order” may push them to literally take the plunge. Visitors deeper in the conversion funnel will likely be higher-intent and, therefore, respond better to authoritative, commanding CTAs that prompt action, like the word “Order”. In contrast, a low-intent visitor, earlier in the funnel, may need more gentle nudges and nurturing. They may respond better to low friction CTAs, like “learn more”. It’s always best to test — and not go on gut. Testing a small copy change may enable you to avoid a considerable drop in revenue. Want to see more surprising studies like this one?